Today, I'm thrilled to present Andrea Baker, author of Leah, the first book in the World's Apart Series. If you missed my review of her wonderful book, you can find it here. Tricia: Hi, Andrea. Before we get started with the interview, can you tell us a little about yourself? Andrea: I’m pretty ordinary really to be honest – I’ve been married now for fifteen years and we have one daughter. We moved house last year, and we live just a few miles from the location of my book, although a little further away then we used to be, in the beautiful English county of Warwickshire. I’m self-employed as an Interim Manager, which essentially means that I go and work for clients to resolve specific issues for them, ones that require my specialist skills on this occasion – I then move on to the next client or another issue. I specialize in the customer journey in the public sector, but despite this, I am actually quite a shy person, so I find marketing my books quite hard. I’ve just booked my first library talk, at my local library, for August, and I already have butterflies! Tricia: I can totally understand shyness when it comes to marketing, but I'm sure you'll great at your reading! When did you begin writing? Andrea: I’ve always made up stories, for as long as I can remember. I learned to read very early, before I even started school, and as each new book captured my attention, I’d spend hours playing with those characters, making up “what happens next” stories in my mind. As the years went on I started writing them down, but it always seemed hard keeping the handwriting up with the ideas in my head. When I graduated I made myself stop writing them down, as I dismissed the ideas as being fanciful, and not something that a “grown-up” should do – so although ideas still occurred to me, there was nothing written down for years. The idea for this series has existed now for probably about five years, on and off, but it was when I was driving home from work one day, during a thunder storm, and lightening lit the castle, that the missing pieces fell into place, and that was it. The first thirty-thousand words were written at night over the next six weeks, once I’d finished work and put our daughter to bed. The book finally got finished a year later when I was made redundant. Andrea: I most definitely fall into the latter category! Although I have an idea of a story, and where it might be going, once I start letting the images come, it’s a struggle to keep up. When I write, it’s almost like watching a film in my head, so it can go off at the strangest angles. In terms of when I write, it’s almost always in the evening after my daughter is asleep and all the chores are done, or the occasional weekend if we get any spare time. Because I work as well, finding the time is difficult, if I’m honest. Tricia: I'm a pantser, too, so we have that in common. Can you tell us about your most recent release? 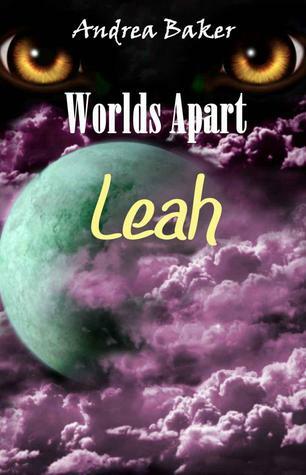 Andrea: “Worlds Apart – Leah” is my debut novel, and the first in a series. It’s about a young woman, facing a major change in her life that starts to experience bad dreams and strange occurrences. Things seem to get worse when she meets another new student, Ben, but she doesn’t understand what is going on, and what her nightmares are trying to tell her. Tricia: I absolutely adored your book. How did you get the idea for it? Andrea: That’s difficult to answer, because it came over such a long period of time – but when I was pregnant, I remember being fascinated with the idea of dreams trying to break through, to tell you something that your conscious mind had forgotten, so I guess it stems as far back as that. It was about three years later when I had the next few ideas around the car accident – I can’t say anymore for fear of giving spoilers away. However, it was the thunder storm that cemented the story in my mind, bringing all the bits together into one story. Andrea: At this stage I’d have to say Leah, although her Father is a firm favorite as well, as we find out so much about him, and he features further in the rest of the series too! Leah goes on an incredible journey, at the start of Book One she is shy, insecure and more than a little naïve in many ways, as she’s spent her teenage years without her Mother. Later in the series we see her coming more into her own, as all the pieces fit together and she understands who she really is. That journey is incredible, but for me she’s very real too – with the insecurities that we all live with, if we’re honest with ourselves, particularly when we’re so young. Tricia: If I picked a favorite, I'd pick Leah, though Ben is a close second. How important is setting in your book? Andrea: Very important – it sounds daft now, given how close it is to home, but until that storm, and the flash of inspiration (please excuse the pun…), I’d struggled to get the pieces to fit together. Tricia: How much research did you need to do before writing, particularly in terms of the castle and its history? Tricia: Well, you did an excellent job of depicting the castle and the setting. Reading your book was like watching a move. I could see the whole story playing out in my mind. What was the most challenging aspect of writing your book? Andrea: Time – I’d be sitting in a meeting at work, with my mind working out what happens next in the story, while trying to have an intelligent discussion about staff planning and budgets! My dream is to be able to write full time, but that’s probably not realistic. Tricia: Time does seem to be a huge challenge for most authors. Which authors have inspired your writing? Andrea: There are so many! I’ve read so many forums where other authors slam one another for not naming a specific source of inspiration, that it scares me, because I’ve read so many books over the years that I can’t name them all. I watch my daughter in our library now, or in a bookshop, and she does exactly what I used to do, wandering up and down the aisle, picking out whatever takes her fancy. At one stage I would read 14-16 books a week, and although I can’t name them all, they’ve all inspired me in one way or another. My favorite stories as a child were The Chronicles of Narnia, anything by Enid Blyton, adventures like Nancy Drew and The Hardy Boys, as well as the Anne of the Island series by Lucy Maude Montgomery. Andrea: Well, I have Book Two under way, and Book Three outlined, but I also have a thriller in mind, based upon a gorgeous former Abbey I recently stayed in on the edge of Loch Ness, and I’m also working on a piece of historical fiction. The latter is extremely personal to me as it is based around the life of my Grandfather, who grew up in inner city Birmingham during World War 2. His father had passed away when the children were young, so they grew up penniless. The stories are quite difficult to think about in a way, but I still think it’s important for people to understand what it was actually like, only sixty years ago. Tricia: Ah, I can't wait to get my hands on the next Worlds Apart book! On your blog, you host a popular series called 'Castle of Dreams.' Can you tell us about this? Has the series triggered your imagination and inspired any new castle-centric stories? Andrea: This was another flash of inspiration for me. I love Castles, and always have, they’ve inspired dreams, and my own nightmares over the years, and were also part of the reason I fell in love with Aberystwyth, where I went to University – the theological college on the sea front is very castle like. I was intrigued to see what they meant to others, be it real life or fiction, and how others use them in their writing. They haven’t so much inspired any more stories, but I’ve got a longer list of places to visit now – and I’m sure those visits will result in one or two ideas also! Tricia: I hope so! What advice would you offer to new or aspiring authors? Andrea: Don’t give up, and don’t get discouraged by rejections! Seriously, my book is very different to the first version, you have to accept that there are going to be mistakes and inconsistencies in the first draft – so use a few beta readers, and don’t take their constructive criticism personally. You’ve asked for their advice, so take it with grace, even if it does hurt. Secondly, there isn’t a well-known author out there who hasn’t had their fair share of rejections, many joke about being able to paper a wall with them – just because one person says no, it doesn’t mean your book is useless. But, if you are lucky enough to get some actual feedback alongside your rejection, that means they’ve actually read your book, then take it and listen to it. Try to understand what they are referring to, and seriously consider whether it would make the book better. Most rejections are standard mail merge documents, so feedback means you got far enough to be read – well done! Finally, if someone actually offers to publish your work, research them carefully. If they’re dreadful at responding to your emails now, then ask yourself how you would cope with that behavior when you’re desperate for an answer on something. Websites like Predators and Editors are really useful here – also if you have to pay them something to publish, run a mile, this is at best vanity press, at worse a rip off. Tricia: Andrea, those are excellent pieces of advice. I enjoyed having you today. Thank you so much for joining us! Where can my readers go to find out more about your work? Thank you so much for having me Tricia, it has been a real pleasure!